The authors found a large number of suggested works relating to spectrum access, those using Auctions, a large number of approaches use the Game theory, but those using Markov chains are fewer. However, some research has been done in this area using Multi Agent Systems (MAS). The idea of CR was officially presented by Joseph Mitola in a seminar at KTH, the Royal Institute of Technology in 1998, later published in an article by Mitola and Gerald Q. Maguire, Jr. in 1999 (Mitola J, 1999). 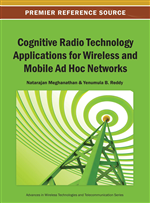 The term Cognitive Radio is used to describe a system with the ability to sense and recognize its context of use, in order to enable it to adjust its radio operating parameters dynamically and autonomously and learn the results of its actions and its environmental setting operation. CR is a form of wireless communication in which a transmitter/receiver (transceiver) can detect intelligently communication channels which are in use and those that are not, and can move to unused channels. This optimizes the use of available spectrum radio frequency while minimizing interference with other users. The principle of CR, included in the IEEE 802.22 and IEEE 802.16h (Grandblaise, 2006), requires an alternative spectrum management (i.e., a mobile called secondary may at any time access to frequency bands that are free, that is, not occupied by primary user (PU) of the licensed band). The secondary user (SU) will assign the service once completed, or once a PU has shown an inclination connection.